Located at a distance of 65 KMs from Panaji, Mahadev Temple is one of most gorgeous piece of relic from the Golden ages of India at Tambdi Surla. 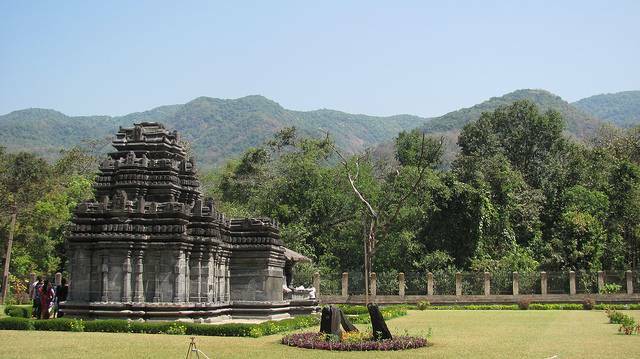 The magnificent 12th century Mahadev temple is built in Jain style. Its roof was never actually completed. The location of the temple is in a class of its own. Not only is it slightly out of the way but it’s also situated in a most picturesque location with hills and greenery in the backdrop. This basalt temple with its amazing intricate carvings is said to have similarities with the time-worn but lovely temples of Aihole. Temple is in a forested area and is accessible from Valpoi in Sattari Taluk. A most unique specimen of the typical Kadamba-Yadava architecture. It has fascinating figures of lord Vishnu and Brahma along with their consorts. Legend has it that the Lingam here is protected by a giant cobra. The temple is built in a way such that the first rays of the sun fall on the presiding deity. This temple has survived the onslaughts of time and its time-worn and decadent appearance somehow adds to its charm. The headless figure of Nandi has 4 matching columns surrounding it, one of which has the royal symbol of the Kadamba kingdom. If you happen to come here on Maha-Shiv-Raatri, then nothing like it. The glittering waters of river Surla is just a flight of steps away. This ancient temple of a long bygone era might make you forget the year you are in. If you are a history enthusiast or simply somebody who has an eye for beauty, this is a place you must visit!